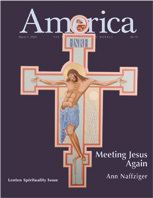 This article appeared in the March 7, 2005 issue of America: The National Catholic Weekly. "I must have heard my grandmother tell my grandfather a thousand times, ‘Get behind me, Satan,’ but I thought she made up that phrase. I didn’t know it was in the Bible!” “I thought it said somewhere that Jesus died when he was 33 years old. Where is that?” “Where’s the part where it says that Veronica wiped the face of Jesus?” “We should write to our bishop and ask for a new Lectionary!” Such were some of the questions and comments I heard when recently teaching a class at my parish. The course was called Introduction to the Gospels, and the students were required to read all four Gospels in their entirety during our eight weeks together. They were sometimes astounded to discover how much is included in the four Gospels—and what is not. My favorite comment was the last, which several students made their rallying cry by the end of our time together. The student who originally suggested that the Catholic Church might benefit from a new Lectionary was the same woman who had earlier called for a third Vatican Council, as she began to discover some of what she had been missing by hearing only the Gospel excerpts read during Sunday Mass. Many of the students in the class were at various times pleasantly surprised, heartened, puzzled or angered by what they encountered in reading all four Gospels, and at seeing such different faces of Jesus in different parts of the New Testament. For some of them, like the man who did not know the origin of his grandmother’s terse order to his grandfather, it was the first time in their lives they had read the complete text of our canonical Gospels. For most of them—almost all of whom happened to be adult converts to Catholicism—it was also their first time studying Scripture from a Catholic perspective. Several of those converts were already quite well versed in Scripture, but they found much to chew on as they read it from this new angle. Some of the Catholic theology they were able to affirm; some they were not. “Explain to us again why Catholics say Mary was ‘ever-virgin’ when it’s not in here anywhere,” one student said, knowingly flipping through the infancy narratives of Matthew and Luke. The converts were genuinely baffled by Catholic traditions that are not well founded in Scripture, because the churches of their childhoods (mostly Baptist and non-denominational) stressed Martin Luther’s norm, sola scriptura—“Scripture alone.” The papacy? Clerical celibacy? Where is there biblical warrant for that? Indeed, as they were able to point out, some Scripture passages even contradict such notions. In such instances, my job was to confirm that yes, Catholics are reading the same Gospels as Protestants, but besides looking only to Scripture to understand God’s revelation, we take into account the Catholic Church’s Tradition, with a capital T. My delight came, then, not in trying to convince them what they should or should not believe, but in teaching them the genesis of the Catholic Church’s teachings, encouraging them to evaluate Scripture in light of that and urging them to respond to Jesus accordingly. Some students expressed a newfound sense of freedom and responsibility simply by discovering the authority that Jesus commended to his followers. After a particularly inspiring discussion one evening about how the Jesus of Matthew’s Gospel vested his followers with immense responsibility as the “light of the world” and the “salt of the earth,” one student, a cradle Catholic born before Vatican II, exclaimed, “No wonder Catholics weren’t supposed to read the Bible when I was growing up!” If knowledge is power, then the converts in the class were completely miffed by the fact that lay Catholics did not know what power Jesus has given to us—all of us, not just to Peter and his successors. That, it seemed, was the crux of the converts’ appeal to the cradle Catholics in the class—take responsibility for reading the Bible yourselves! Don’t wait for others to do it for you! The only homework I required was that the students read each Gospel in its entirety in one sitting on consecutive weeks. I knew from my own experience doing this in graduate school that they would be intrigued by what they discovered in reading the Gospels as literary and theological wholes. As they reported, it was a very different experience from hearing only small sections parsed out at the pulpit each Sunday. We read first the Gospel of Mark, “the Gospel with no Christmas and a shaky Easter.” Immediately they wondered why Mark did not include any stories of Jesus as a baby, and they noticed that there is not one, not two, but three different endings. Next came Matthew. Although the students mostly appreciated the additions Matthew made to Mark’s Gospel, one woman admitted she struggled not to fall asleep while reading Jesus’ long teaching discourses, which go on for pages at a time. By the time we got to the Gospel of Luke, the students (almost all women) were coming to class full of enthusiasm about that Evangelist’s attentiveness to women as disciples. “I’m so glad to finally read about some women disciples!” one of them exclaimed. “At least someone recognized that there were more than just men in the world in Jesus’ time,” another said. “How come we never get to hear about the women at Mass?” a third asked. Although they recalled that Mark and Matthew had both mentioned several women, most of whom had responded favorably to Jesus, the students were struck by Luke’s inclusion and positive portrayal of so many more. They noticed his careful attentiveness to balancing stories and parables about men and about women, and the cumulative effect on them as readers was significant. It was Luke’s work that stirred up their indignation about the shortcomings and omissions of the Sunday Lectionary cycle. From that class period onward, my students began clamoring for a revision of the Lectionary. They realized that if we read only the Lectionary readings, we would never hear about such women disciples as Joanna and Susanna and the others mentioned in Luke 8. I’m afraid I gave them more fuel for their fire by letting them in on the little known secret that in Paul’s letters, he commended women co-workers, missionaries, leaders of house churches, “deaconesses” and “apostles” with whom he had worked. The students were upset to find out that most of these women too are omitted from our Lectionary texts. When we came to the Gospel of John, I was especially curious to hear the students’ reactions to this literary and spiritual masterpiece. One woman declared, “This is the Gospel of LOVE.” We chuckled at how another student referred to Nicodemus’s encounter with Jesus as the “Nic at Night” meeting. I taught them an interpretation of the story of the woman at the well, which, with the exception of one protest, they appreciated. I pointed out that in line with the prophetic tradition (go read Hosea—it’s in there, I suggested to them), the woman’s five husbands could be symbolic of the five kingdoms that ruled over Samaria with their foreign gods. The woman engaged in an intellectually savvy debate of Jewish and Samaritan theology in the broad light of day—as opposed to “Nic at Night’s” furtive meeting. (Yes, that savviness is in the Gospel.) The woman was the recipient of Jesus’ first great “I am” declaration. Finally, as a mark of apostleship reminiscent of the fishermen who abandoned their nets to follow Jesus, the woman left her water jug behind in order to bring others to Jesus. When I finished this presentation, one woman wailed, “Then how come all we ever hear priests talk about is that she’s an adulteress?” I charged them with going out to share the good news with any priest they meet (and to give them a copy of Sandra Schneiders’ book Written That You May Believe), for it seems that even when some passages are included in the Lectionary, the preached interpretation overlooks some of the facts. In the end, I think that reading the Gospels in their entirety raised more questions, ruffled more feathers and soothed more souls than the students had expected it would. I knew I could never address every question or every reaction they had to their assignments, yet I was thrilled to pique their curiosity about the written memories of Jesus that have been handed down to us. If reading these Scriptures did nothing else, I pray it sparked something new in their relationships with the Christ who once walked this earth. The students have the rest of their lives to puzzle over the texts, ask questions about the church’s tradition and pray for what it is that God wanted to say “through human beings in human fashion” (“Dogmatic Constitution on Divine Revelation,” No. 12). I trust Jesus to get his message across. Ann Naffziger is a hospital chaplain and spiritual director in the San Francisco Bay area.